As a means of dodging US laws that prevent online gambling financial transactions taking place, bitcoin is fast becoming the currency of choice among gamers and poker players. As with most things in life, if people want to do something and government turns around and says they can't, they will still find a way. In this case, US poker players and online gamers have been thwarted in their attempts to make financial transactions between their bank accounts and their online casino or poker room accounts by legislation introduced in 2006. While the activity of online gambling is not necessarily illegal in the US, transferring funds to and from poker and casino gambling sites most certainly is. 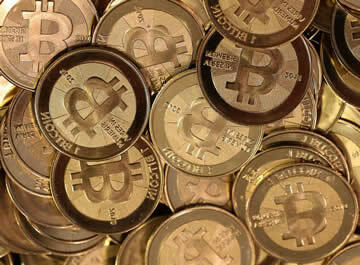 Bitcoin: The New Online Gambling Currency? Many believe the catalyst firing up the move away from a cash-based currency to bitcoin was the seizure of the three top poker websites by the Department of Justice back in 2011. It was clear that an alternative funding mechanism needed to be found and bitcoin seemed to be the perfect candidate. However, it wasn't a quick transition. Many major gambling site operators simply pulled out of the US market and concentrated mainly on Europe and Asia, while a few remained and took their chances. By 2013, the idea was catching on fast that online casino gambling laws could effectively be sidestepped using this volatile currency and many poker sites started accepting it as a means of funding player accounts. At present, bitcoin represents a very grey area with regards to legality since the US authorities can't decide whether it is a currency or not. Since federal lawmakers can't say for sure one way or the other, players and gaming sites are able to use it without fear of prosecution, at least until a firm decision is made. That seems unlikely to happen any time soon as authorities have more to worry about than what is believed to be a minor irritation rather than a serious problem. Thanks to the Treasury's own admission in November 2013 that hard cash and not bitcoin is still regarded as the best money laundering medium, it seems there is little chance of interference in the online gambling industry from government. You'll find several popular poker rooms now accept bitcoin as currency for depositing and withdrawing from an account. Places such as SealsWithClubs (which welcomes visitors with a big sign saying "No Banking, Only Bitcoin. "), Satoshi Poker and BitsPoker all accept bitcoin as their main currency. It doesn't take much searching around to find many more sites that are incorporating the digital money into their payment methods. Whether you like it, care about it or don't give it a thought one way or the other, bitcoin is here today and for the foreseeable future in online gambling.